In a bowl, stir together the egg white, salt, and cornstarch. 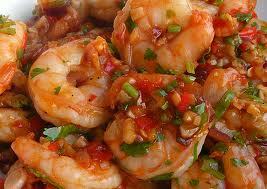 Add theprawns, stirring until they are coated evenly with the mixture. Set aside. In a small bowl, combine the chili bean sauce and ketchup. In a separate small bowl, stir together the chicken broth, rice wine and the sugar. Deep fry the prawns, until they change color. Drain on paper towels or in a colander and set aside. In a wok, heat 1 tbsp. oil over medium-high heat. Add the garlic-ginger puree, and spring onions. Stir for about 15 seconds, until aromatic, then add the chili bean sauce and ketchup. Stir briefly, then add the chicken broth and sugar mixture into the pan. Boil for a few seconds, then add the prawns back into the pan. Toss quickly and serve Szhechuan prawns over rice.